With our long Easter weekend last year, I scored a good online deal and we got a rustic cabin in the hill country for several days. We decided to try a shorter outing for one night this year and got a hotel suite just up the road in Round Rock. 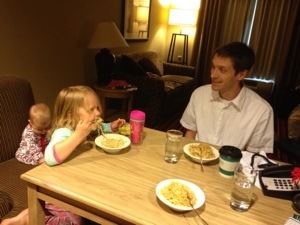 We picked a suite that has an actual separated bedroom so we could put the girls to bed then hang out a while. Hannah was most excited about swimming. Unfortunately, the pool was outdoors and not heated. I only put my feet in and lost feeling quickly and got out. Violet cried when I dipped her legs in. Brett was a trooper and stood on the top step while a goosebump-covered Hannah played for about 20 minutes. So that didn’t go as we hoped. 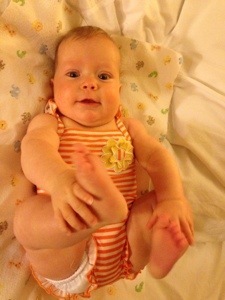 But Violet was super cute in her swimsuit. 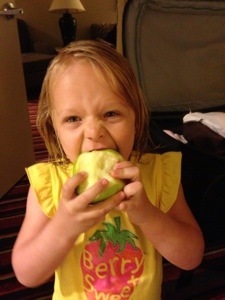 The hotel had fruit in the lobby, so on our way back from the pool, Hannah picked a giant green apple to tackle. Then we had dinner. 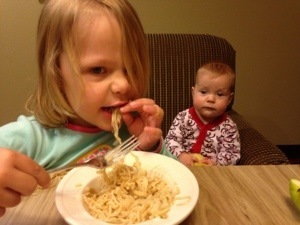 Since we had a small kitchen in our suite, I decided to be frugal and fun by making ramen noodles for supper. 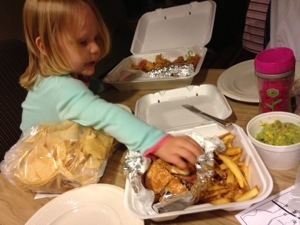 These were a big hit with Hannah. After dinner, we put Violet down and made popcorn while watching “Tangled.” We tried putting Hannah down, but she would not stay on her cot. We tried various things with no success and decided to just let her stay up. About this time, we all got really hungry. My attempt at a frugal and fun dinner just didn’t cut it. So Brett went out to get take-out from Chili’s. The food made everyone feel better but then the Jayhawks lost, so we were sad. We also realized the only way Hannah was going to go to sleep was if we all went to bed together. So we settled in the king bed like a cute co-sleeping Ikea commercial and big girl and daddy were asleep in minutes. Violet woke up during this time, and when I was done feeding her, she didn’t feel like going back to sleep. She figured out that the raised bed of the pack and play had a little wiggle to it, so if she whipped her legs up and down really fast then it would start swinging. This was apparently hilarious because I got to lay there for quite a while listening to her giggle while shaking her legs around. 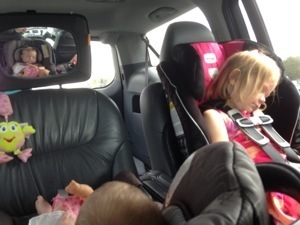 This morning we headed home after a tasty breakfast. 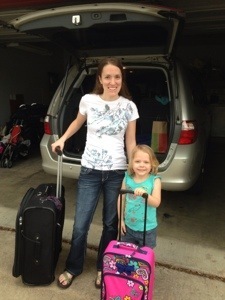 A highlight of Hannah’s trip was using her very own suitcase. So that was our “staycation.” To sum up: pool=fail, dinner=fail, bedtime=fail, Jayhawks=lost. But Hannah thought it was fantastic. And even though it didn’t go quite like I hoped, I thought it was fun and would do it again with some tweaks. Our CSA goes through the winter, so we’ve been enjoying fresh veggies as usual the last few months. There is less variety, however, and one item that has been in the boxes every time for the last 3-4 months has been beets. We have eaten more beets in the last year than I am sure I have eaten in the entire rest of my life. But we really like them, so it’s okay! 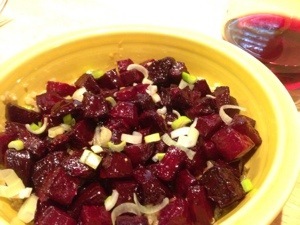 Beet preparation tip: using a black cutting board means no more staining! 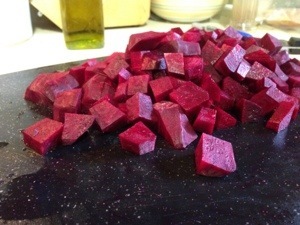 Here’s a nice pile of chopped beets, and the cutting board doesn’t look like part of a crime scene. Here’s the finished dish – roasted beets on quinoa with a lemon balsamic vinaigrette. Brett’s favorite thing to get at Panera is the Fuji Chicken Salad. This is notable since it’s pretty much the only time he orders salad at a restaurant. It’s a green salad with grilled chicken, pecans, cranberries, blue cheese and dried apples. 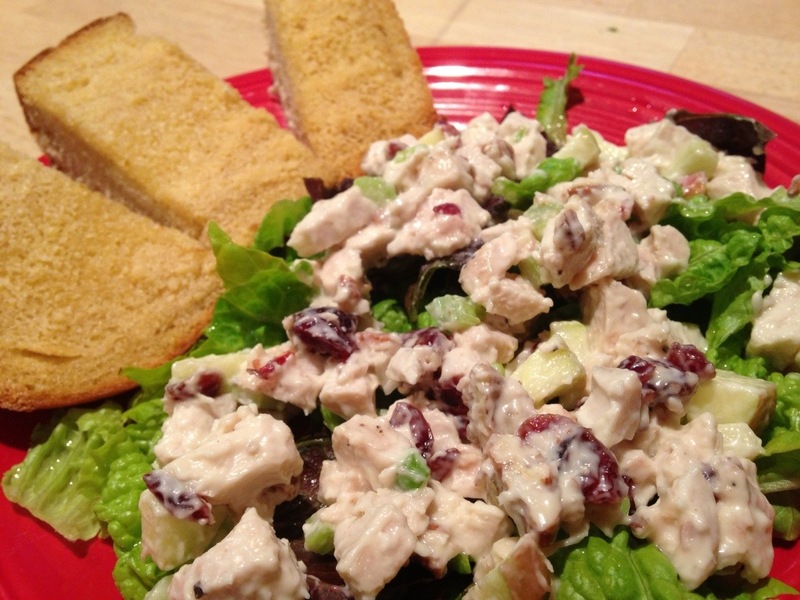 I had chicken salad on the menu plan and decided to tweak it to copy the Panera salad. Except chopped up and mixed with mayo. ;) Most ingredients I already had on hand, so it was a great way to use up items from my CSA box, freezer and pantry. Mix all ingredients except greens. Easy to make ahead and refrigerate. Serve over greens and drizzle with a little white wine vinegar. Brett liked this take on his Panera favorite, and it was perfect as the weather made a nice warm upswing this week. Of course, all these ingredients would be good without the mayo just on a green salad, but this would be really yummy on a croissant for a brunch. And the mayo hit my non-dairy creamy fix. I think I’m going to morph Panera’s Thai Chopped Chicken Salad next. My eyes popped out of my head when I saw this. The usual art product around here is a page of wild scribbles, which is fine and developmentally normal. 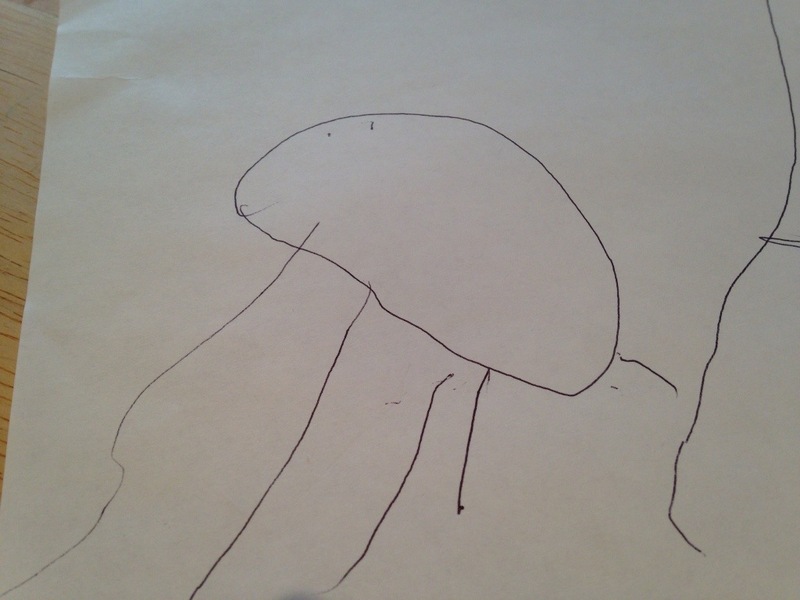 But today, Hannah drew this and announced it was a beaver. I’m impressed what she can do when she slows down a little bit! And good thing I took a picture because a few seconds later she had scribbled all over it and told me she was giving him hair. 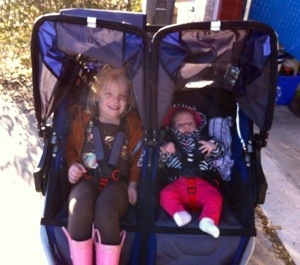 The Texas Alliance for Life has an annual fundraising walk. We have supported our Austin cousins as they participated in the past because we often seem to be out of town for the event. This year we’re in! Check out our personal fundraising page and support Team Wiard! Our goal is $200. Physically, going off dairy hasn’t been too tough. Turns out, I really know a lot of recipes that don’t involve cheese. Almond milk has been an easy substitute for baking. I stopped putting cheese or sour cream on stuff. We don’t eat a lot of processed food, so I haven’t had to avoid too much hidden dairy. I’m careful to read labels. Mentally, going off dairy has been rough. I like cheese! I want to eat nachos, cheeseburgers, pizza, ice cream, cheesecake… mmmmm. Many of those things, I’m finding I’m not actually missing the cheese when I eat them. Papa John’s pizza without cheese is really not bad, especially when drizzled with the garlic sauce which is actually dairy-free. And when we went to my favorite burger place, I happily snarfed my burger before remembering I’d ordered it without cheese. But I’m not going to try the recipes for tofu “cheesecake” just to quell my cravings; I’m pretty sure it would just be disappointing. At the women’s retreat a couple weeks ago, there were some gorgeous little red velvet cake bites with luscious layers of cream cheese frosting. I wanted one so bad. Wellll, I really wanted five so bad. But I was good. It’s most difficult when I’m not cooking. I couldn’t eat the dessert or soup at the women’s retreat, I can’t eat most of the breakfast casseroles at MOPS. I was invited to a friend’s house for lunch, and I felt awkward informing her of my new menu limitations. However, she was very gracious and modified her ingredients for me. 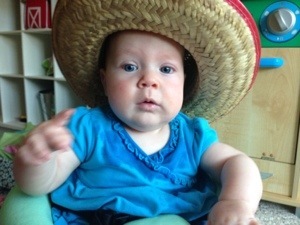 She also understood my plight because she has a new baby and had been off dairy for a while as well. – Dairy substitutes are not “real food:” we try to stick to whole foods or real foods in general. Dairy subs don’t fall in this category, so I’ve been purchasing a few more processed foods than usual such as almond milk, Earth Balance spread and soy cheese. – Creme-filled cookies: don’t have dairy! Some don’t at least, yay for me! I can have a junk food splurge with a creamy frosting center and no dairy. I’ve found the site Eating Dairy-Free for Your Baby to be very helpful. Dairy sensitivity in babies in usually caused by casein, the cow milk protein. So just switching to lactose-free dairy products doesn’t help, it’s not a lactose intolerance. Levels of sensitivity vary, and I’m thankful Violet doesn’t react to certain things such as the small amount of milk in the breading of a Chickfila spicy chicken sandwich.